As heard throughout the entire musical catalog of Bruce Springsteen's blue collar repertoire, small town USA existentially divides its residents in half. There are those who can't wait to escape what they perceive is a dead-end life in a one-bar town and those who can't imagine a life spent anywhere other than their own tight-knit community. And often in these places, everyone knows the secrets and lies hidden, told and kept by everyone else and loyalty to one another – like blood – proves thicker than the water that pumps into the towns and keeps them alive. Morally centric dramas set in small towns that operate with the aforementioned push/pull dynamic have long been a rich source of creative inspiration for filmmakers. Mystic River for example, perfectly captured the relationship between those who've walked away from the old neighborhood (even if they live in a city as large as Boston) and those who stayed. And in Mystic as well as many other pictures using the same framework, directors strive to illustrate the bonds of brotherhood vs. the mistrust of outsiders. Above all, they emphasize their characters' dedication to handling things on their own and without the help of someone else -- regardless of whether or not they used to live on the same block of said party back when they were ten. It's this same basic principle that writer/director Josh Sternfeld attempts to infuse in the low-budget, meandering misfire Meskada, which marks his second feature outing following his critically acclaimed debut Winter Solstice . And given Sternfeld's decision to use an economically strained small town as a timely backdrop for his work, I understand, admire and applaud Sternfeld's intent as he had all the ingredients for an intriguing character-driven tale complete with the requisite “prodigal son returns” motif. 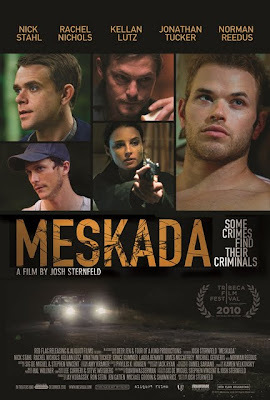 Shortly into Meskada, Detective Noah Cordin (In the Bedroom 's Nick Stahl) discover he must investigate the inhabitants of his old stomping ground when a child is found murdered during what appears to be a burglary gone very wrong in his more affluent community. Due, not only to the unspeakably tragic nature of the case, but also the fact that the deceased boy is the son of a widowed city government employee, Cordin is saddled with an assigned Sheriff's Department partner for the crime in the form of Leslie Spencer (Rachel Nichols). Unfortunately and perhaps in an attempt to hearken to In Cold Blood or other matter-of-fact pictures, there is absolutely no mystery regarding who the perpetrators are from the start since Sternfeld opens the film with the scene that occurs just before the robbery turned bloody. Likewise, the filmmaker does his movie a greater disservice by still treating it as though it were a whodunit and spending equal amounts of time on both the unremarkable cops as he does on the unremarkable killers who don't seem all that evil. 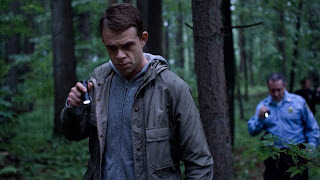 Yet instead of just settling for a decent police procedural approach, you're never certain exactly what Sternfeld wanted to do with his film, as frequently he leads us into some very good new subplots, questions, or character debates but fails to deliver in a way that's either logical or interesting. And despite the fact that the second half is stronger than the first as it teases you into thinking he's going to pay off on hints about a factory conspiracy or love triangle gone bad, it's even more disappointing considering Sternfeld's background as a former TV documentary series editor since the pacing of Meskada nearly puts you to sleep. Featuring a great turn by Stahl and an intriguing, solid role by Boondock Saints star Norman Reedus, Meskada will perhaps most fascinate from an acting standpoint for showcasing Meryl Streep's daughter Grace Gummer -- even if much like sister Mamie's work so far -- it's evident that the Gummer girls aren't about to threaten Streep's legacy as the greatest actress of her generation. While it's apparent that Sternfeld has a lot of good ideas but tragically no clue how to string them together into a compelling narrative, ultimately Meskada proves less effective or memorable than a little Springsteen ditty about small town life you're bound to hear on the radio.